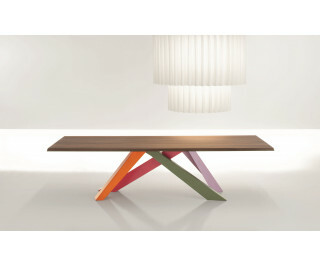 The legs of Big Table are made of laser-cut steel, painted matt in different colour combinations: bordeaux / racing green / brass yellow / royal blue, coral red / orange / green / lilac, powder pink / brown / dove-grey / amaranth, or completely in anthracite grey, white, bordeaux, dove grey, brown, Corten or copper-bronze finish. The table top is available in many materials and finishes. Big Table is available in the fixed or extending version.